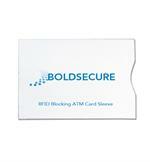 ATM card holders from DieboldDirect help extend the life of your customers’ cards and help increase machine uptime. ATM card holders help protect debit and credit cards from normal wear and tear, as well as keep the card clean to help reduce the transfer of dirt and dust to ATM card readers. 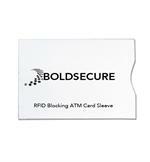 Does your bank or credit union issue RFID technology embedded cards? 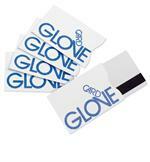 Give your customers / members peace of mind by offering a complimentary RFID blocking protection sleeve. These on-demand cards can be customized to include your name, logo or additional branding messages. Replace your checkbook with CardBooks. These wallet-sized card register books feature a pocket inside the front cover to hold and protect your card. 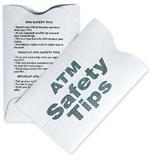 Customers and members who do not use card holder will increase the wear and tear on their cards which can negatively impact your ATM over time. If you are experiencing downtime from dirt and other build-up in your card readers, make sure to clean your card reader regularly by using our engineer tested, ATM cleaning supplies.